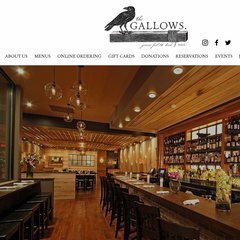 www.Thegallowsboston.com - The Gallows | Genuine Food & Drink. Topics: The Gallows, Dinner, Brunch, and Lunch. thegallowsboston.com The Gallows | Genuine Food & Drink. 119 users visit the site each day, each viewing 2.30 pages. The programming language environment is PHP/5.2.17. The Endurance International Group Inc (Massachusetts, Burlington) is the location of the Nginx server. It has 2 DNS records, ns2.ipower.com, and ns1.ipower.com. PING www. (66.96.132.111) 56(84) bytes of data.